The gun control industry claims that firearm ownership is on the decline. 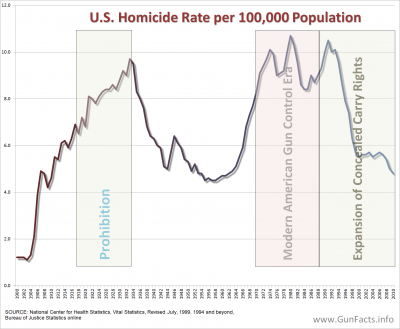 Then again they also claimed that gun control works, and that has been roundly debunked. Members of the gun control industry like to bandy two tracking polls that show a downward trend in the number of households in which respondents claim someone there owns a gun. Yet two other tracking poll say gun ownership has remained steady over the decades and even ticked-up in recent years. The difference in the polls is telling. Pew Research and the General Social Survey (GSS) report declining household gun ownership rates. 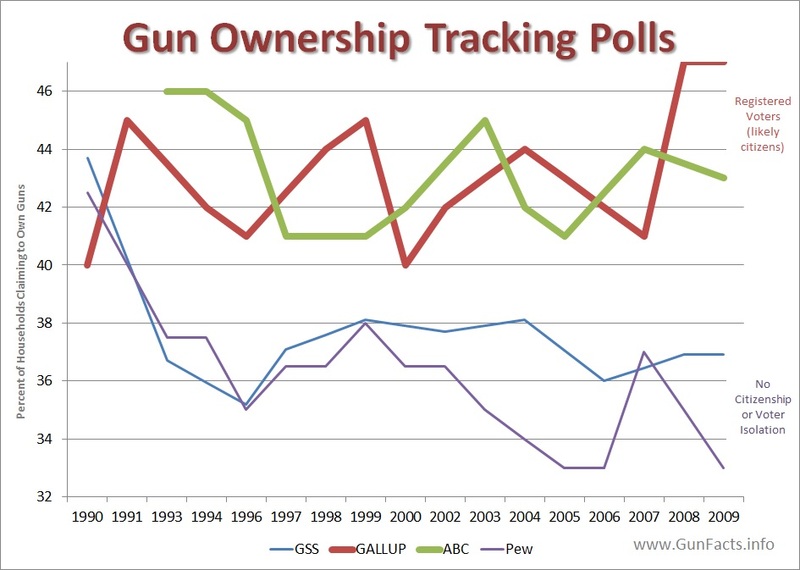 ABC/Post Polls and Gallup show steady gun ownership rates (in the data and resulting chart, we averaged years in which the various organizations did not conduct gun surveys to smooth the relative jumpiness of the lines). Of great interest is how and to whom the questions are asked, or reported. The two polls that the gun control industry touts do not either (a) ask if the respondent is a citizen or a registered voter (and you have to be a citizen to vote in federal elections). The other polls do ask the voter/citizenship question, and report responses accordingly. In the United States, over the time span of this comparison, the non-citizen population has risen nearly 40% (this includes legal and illegal aliens). 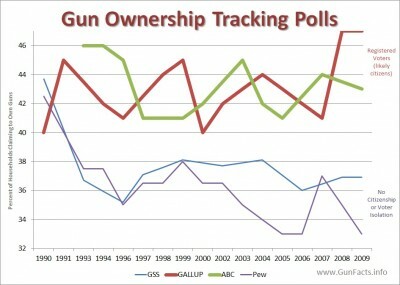 According to the gun control industry’s favored polls, household gun ownership has fallen a bit less than 10%. Making some assumptions about the number of people in an immigrant household, reluctance of immigrants to admit to owning a gun, and other rational considerations, much and perhaps all of the “decline” in gun ownership can be explained with changing national demographics and the percent of households owning guns. Both gun control friendly polls have problems. Pew phrases their question concerning household gun ownership oddly. They specifically ask the respondents if they own a rifle or pistol. Knowledgeable gun owners (which are most of them) know the difference between a pistol and a revolver. Since revolvers are the most popular home self-defense handgun, an increasingly sophisticated gun owning population might accurately claim they do not own a rifle or a pistol when all they have is a .38 revolver in their nightstand. That comic bit of survey hilarity aside, the GSS offers us more worrisome issues. Foremost, is that the GSS is done face-to-face, surveyor to respondent. This is all but guaranteed to cause people to respond differently, especially if their immigration status is questionable. We know from the BATFE’s annual Firearms in Commerce reports that gun sales keep climbing and climbing. The gun control industry thus falsely claims that just utter “gun nuts” are hording gear. But for this to be true, every hobbyist shooter would likely need to quadruple his armory in order to keep up with the pace of new gun sales. That is unlikely at the best of times. But given long and deep recessions, an aging population and the sheer volume of new firepower, this simply isn’t the case. Instead the problem lies not with the polls but with the pollsters. Poorly phrased questions and uncommon surveying techniques, paired with an American immigration flood, means you need to dig under the headlines to find the truth.